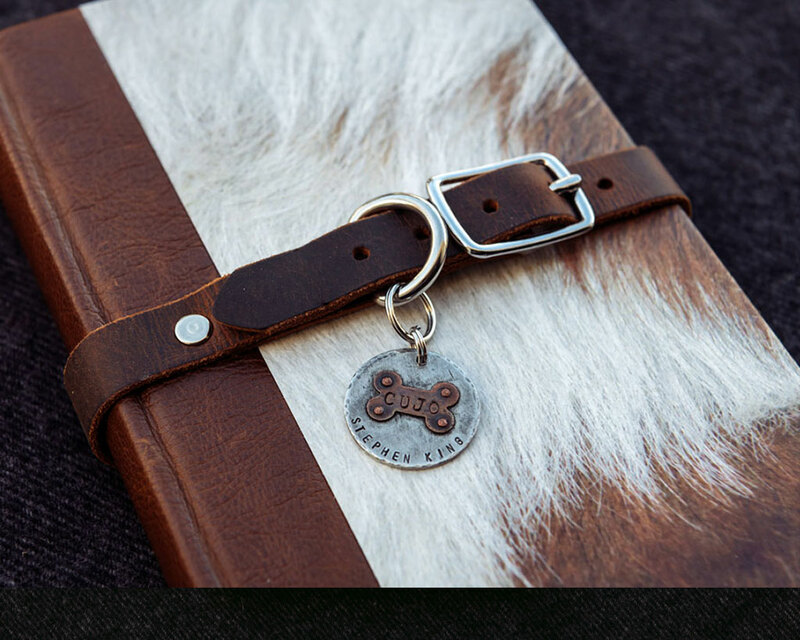 Sign up to receive advance notice of future custom bound books and other news. After much anticipation, we are very pleased to announce the fifth book in this series of custom bound novels by Stephen King. 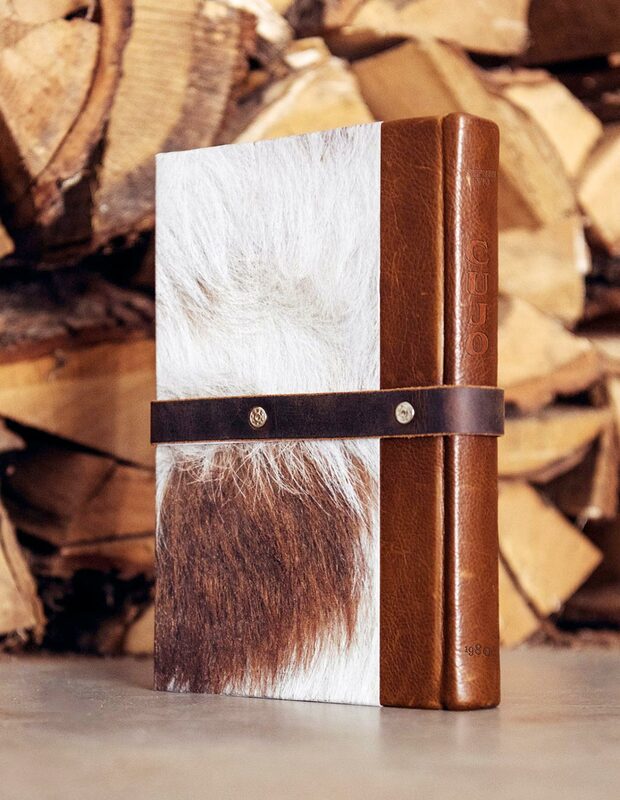 For those unfamiliar with these books, we acquire 1st edition copies, and then work with bookbinders and other artisans to rebind the original book block. 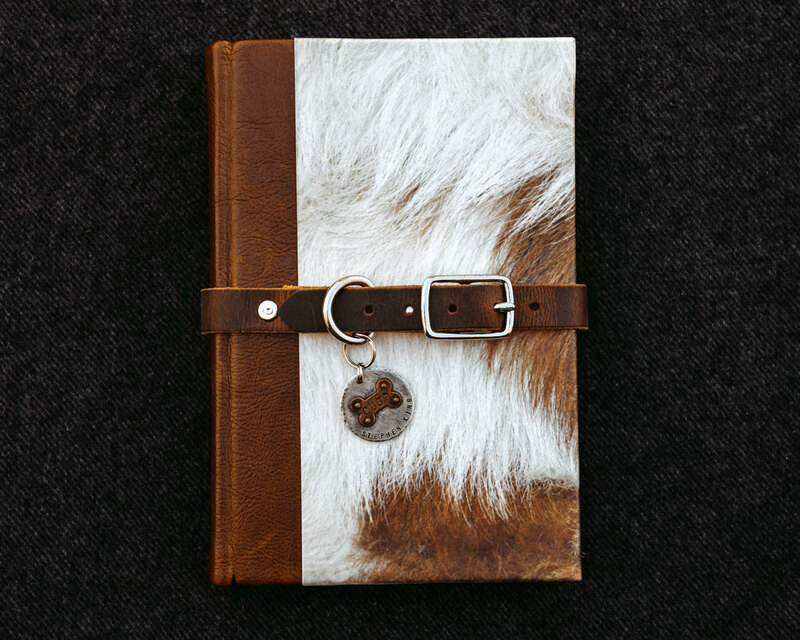 By incorporating elements of the story into the design of the binding we hope to create a unique experience. 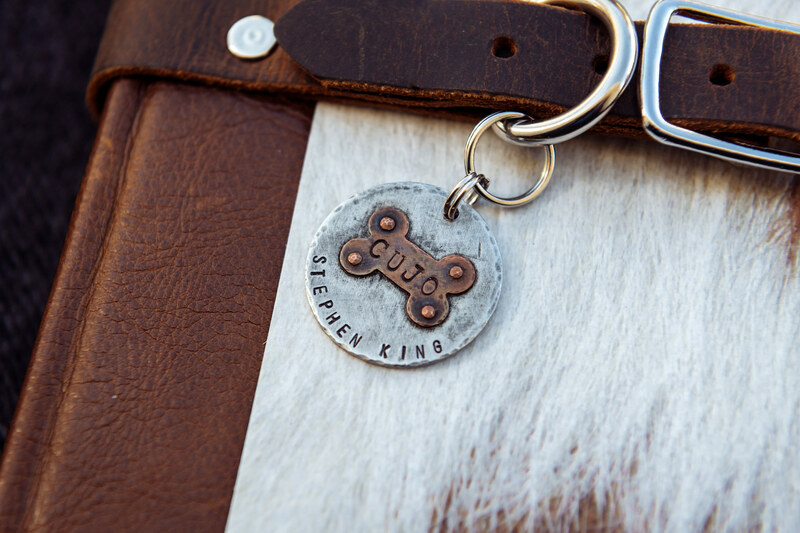 It is our way of honoring the work of Stephen King, and crafting a cover design that collectors and fans can cherish. 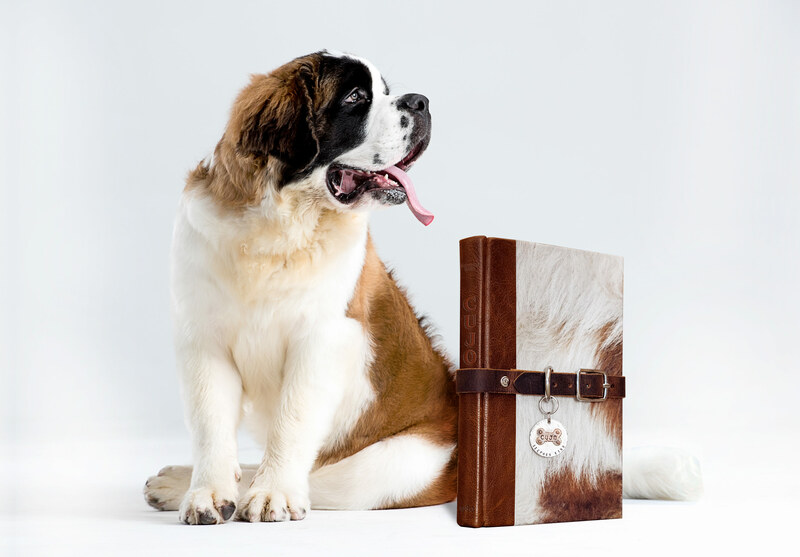 The Cujo rebound is limited to 52 copies and is a quarter leather binding with printed paper boards which have a soft velour-type feel. 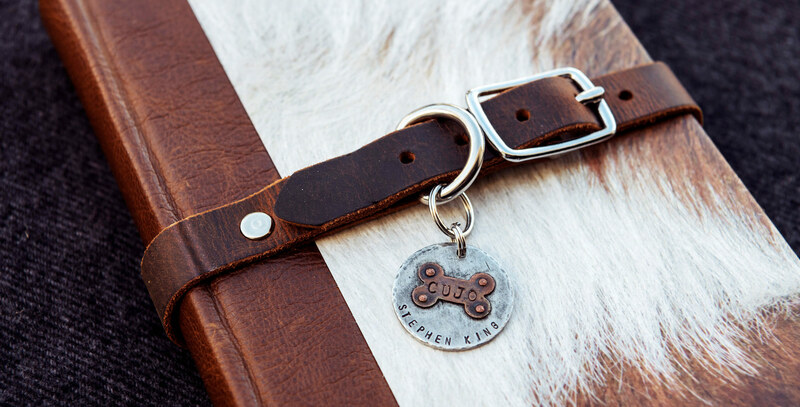 A custom handmade dog collar is riveted to the cover, and it includes a dog tag with the title and author name engraved on the surface. 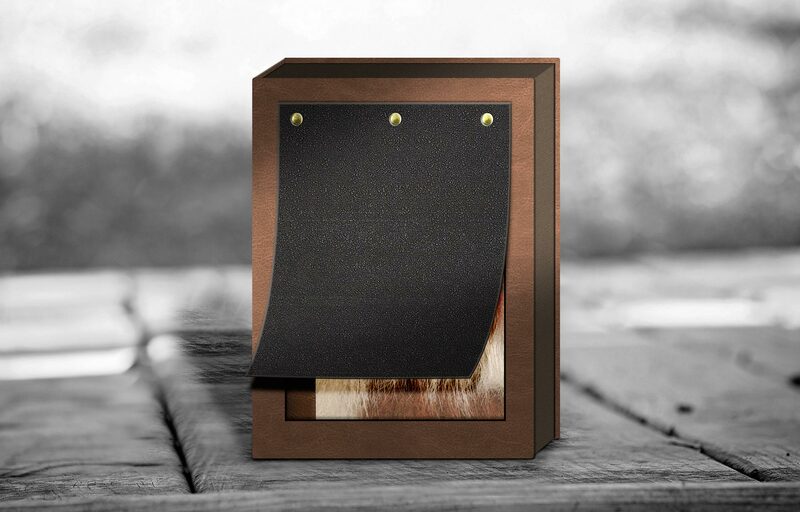 Endsheets are handmade paste papers, and the book is housed in a clamshell box featuring a rubber “doggie door” on the front, revealing the book below when lifted. 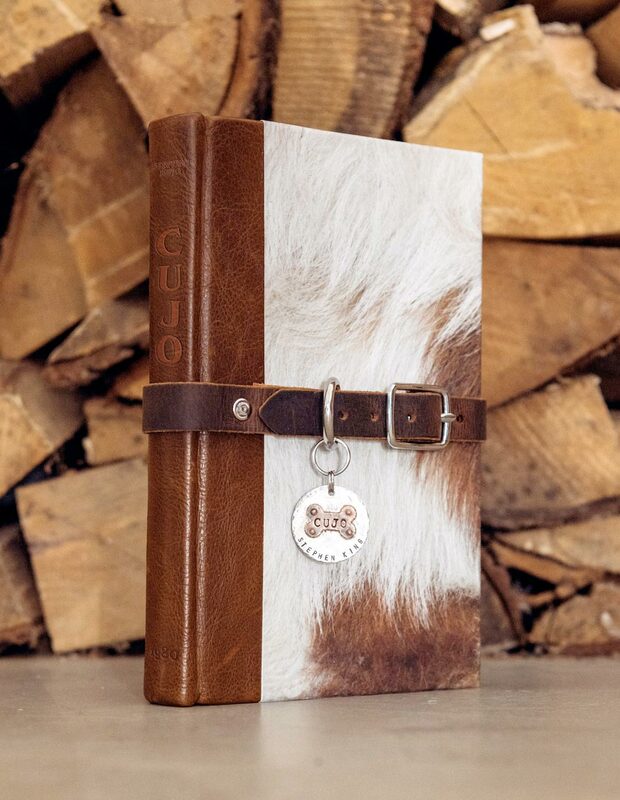 So what’s the best way to house a custom bound edition of Cujo? Well, in a clamshell box that features a rubber doggie door of course! Lifting the flap will reveal the book below, which is removed by opening the box just like any other clamshell enclosure. Artist Steven Stroud is no stranger to these editions. He illustrated the dust jackets for both Firestarter and Cujo. We consider this rebound edition to be a companion piece to Firestarter. 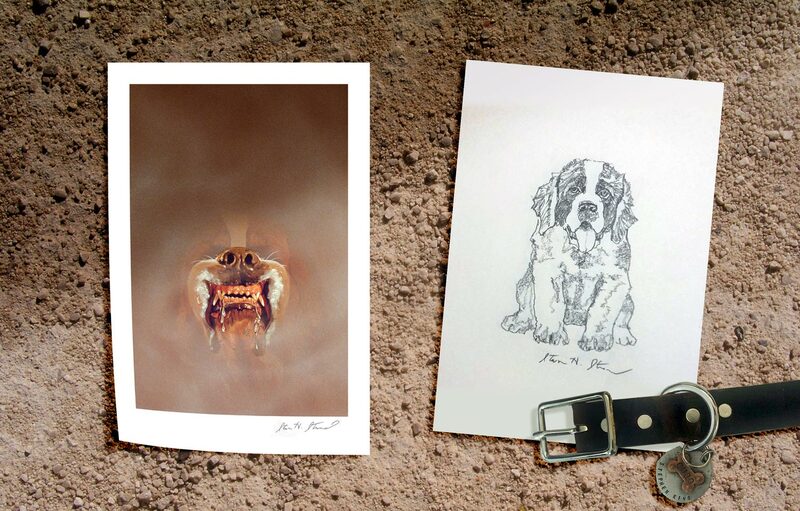 Steven has created an original drawing of Cujo as a cute puppy, which will be bound into each copy, and he has also signed a 6″ x 9″ print of the Cujo cover. 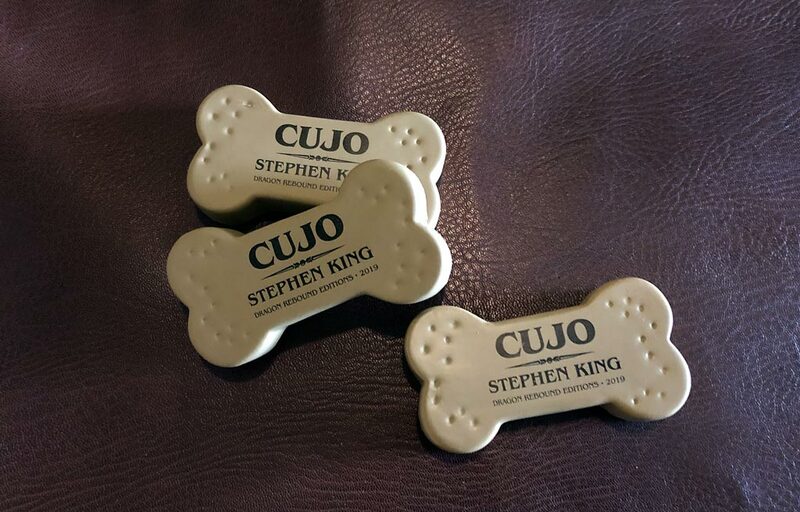 ALL orders will ship with this limited edition promotional item, a custom-printed doggie bone stress ball! A portion of the proceeds from the sale of this rebound edition will be donated to The Bangor Public Library. The vision of the Library is to contribute to the prosperity and growth of the city of Bangor by fostering the spirit of exploration, the joy of reading, the pursuit of knowledge, and the preservation of its community’s history. These editions are first offered to owners of the previous custom bound book, who have right of first refusal on new titles. If a previous owner declines to purchase the new book, or one should become available for some reason, then we contact people on the wait list . We are currently not taking any new wait list submissions. Artwork © 1981-2019 by Steven H. Stroud. Photography by Yegor Malinovskii. THE COVERS COLLECTION PRINTS BY SUNTUP EDITIONS.